The corporation registers a local company in a move to cut out the middlemen. American computer powerhouse Apple recently registered a company in Russia called Apple Rus to handle sales of its products in Russia. The registration means that U.S. corporation could start directly supplying its products to retail chains in Moscow and St. Petersburg as soon as 2013. According to data from SPARK-Interfax, Apple Rus is 99.5 percent owned by Apple Holding B.V. with the remaining 0.5 percent belonging to Irish company Apple Distribution. The company’s charter capital totaled 3.3 million rubles; other financial data were not disclosed. The General Director of Apple Rus is Vitaly Morozko, who, according to the managers of two of Apple’s official distributors in Russia, is also the corporation’s legal advisor. A source close to the electronics retailer said that Apple board members looked for space to house an Apple Store during a visit in Spring 2011, but did not manage to reach a decision. 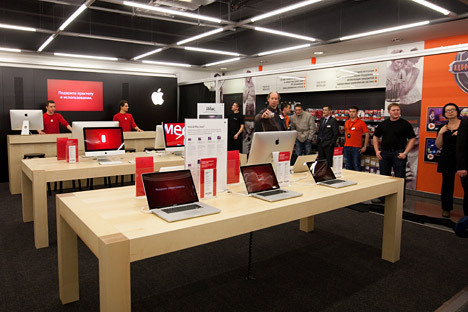 According to the manager of an Apple distributor, it now seems the corporation is likely to start direct wholesale sales in 2013, but there are no estimates for when the first Apple Stores will be unveiled. Between 1996 and 2007, ECS Group was in charge of selling and promoting Apple products in Russia. In 2007, the baton passed to Lanit Group. Also that year, Apple opened a subsidiary in Russia to manage the marketing of its products. In 2008, Apple found its first official computer distributor, diHouse, part of the Lanit company. In November 2009 Apple found its second distributor – a company called Marvel, and in May 2012 it teamed up with a third distributor – OCS. The main distributor of Apple branded products in Russia is diHouse; according to a manager who has had dealings with the company, 75 percent of Apple items are distributed through this firm. iPhones are supplied to Russian consumers through Vimpelcom and MTC. Russia’s other major mobile provider, MegaFon, turned down a contract with Apple in 2010. “By registering a legal entity on Russian soil, Apple is taking a serious step with a view to start supplying Russia with its products directly,” said Yevgeny Butman, co-owner of the Ideas4retail holding. According to Butman, this is the route that is being followed by all the biggest retailers, especially those who are concentrating on the consumer markets: After opening direct sales with a local partner, the next step is to launch an online store. Apple Rus will probably focus on supplying consumer electronics to retail chains in Moscow and St. Petersburg, and the other three distributors will set their sights on the – relatively unsaturated – regional markets, said the manager of an electronic goods chain. It is possible that Apple Rus will also control iPhone distribution in Russia, says the manager of one of Apple’s distributors. He said he had heard rumors that the corporation was not happy with the existing system for distributing iPhones through Vimpelkom and MTS, because the operators were more interested in selling iPhones in their stores than on the wider market. MTS representative Valeria Kuzmenko said MTS has yet to discuss “changes in the way iPhones are distributed in Russia” with Apple, while Anna Aibesheva, a spokesperson for Vimpelkom, was only prepared to say that the operator maintains “a good working relationship” with Apple. Apple Holding needs Apple Rus so that it can control the Russian market, says a manager of one of the corporation’s distributors. By starting direct retail sales, Apple will take a cut of the profit that would otherwise go to the retailers. It is possible that Apple would consider offering retailers a discount depending on their sales results, the manager said. “Samsung and Sony have been selling directly for a long time. If Apple follows their example the price of electronic goods will become more accessible and the market itself will be more civilized,” said Danila Vaskevich, managing director of electronics chain Belyi Veter Tsifrovoi. This article can be read in the original Russian in Kommersant.